It's not easy to be a salmon on the West Coast these days. From California to Alaska, record high temperatures and low snowmelt are affecting the species' survival in their freshwater habitats. Now, new research finds changes in the climate patterns associated with El Nino have shifted and are affecting productivity -- or the levels of things like phytoplankton and other nutrients -- in the Pacific Ocean. The result is causing two species of salmon -- coho and chinook -- that traditionally have different rates of survival in the ocean to trend closer together. The changes, which were especially pronounced from Vancouver Island to southeast Oregon, could bode poorly for the resilience of Pacific salmon species, said Patrick Kilduff, lead author of the new paper, who conducted the research while a postdoctoral student at the University of California, Davis. "The easiest connection is to a stock portfolio. If everything in your stock portfolio goes down at the same time, you're going to feel the pain, whereas if some things did well and some things did poorly you're not going to feel as much pain," he said. "Coho and chinook used to have more difference in abundance patterns along the coast and now they have this synchronicity between their survival rates. That's a concern because if everything is going up and down at the same time, if things are bad, they're going to be all bad for all fisherman and protected species." Although salmon are born and spawn in freshwater habitats such as rivers and streams, they spend much of their lives in the ocean. Even though coho and chinook are both salmon species, they differ in many ways, including how long they spend in fresh water and where they tend to live in the ocean and for how long. This is one of the reasons why it was interesting to discover that the two species' rates of survival seem to be synchronizing over time, Kilduff said. To determine the extent of the fish population changes, Kilduff and his colleagues from the Department of Wildlife, Fish and Conservation Biology at UC Davis and the School of Earth and Atmospheric Sciences at the Georgia Institute of Technology analyzed ocean survival data of hatchery coho salmon from 72 hatcheries and chinook salmon from 104 hatcheries along western North America from central California to southeast Alaska between 1980 and 2006. Kilduff said ocean productivity plays a large role in maintaining fish populations. "When salmon leave fresh water and go into ocean, they are fairly small. If conditions are good, if it's productive, they can grow fast," he said. "When things are better or worse during first ocean entry period, that can have a big impact on the ultimate numbers returning." Pacific salmon managers typically determine what percentage of the stock can be harvested while salmon are young, before they enter the ocean. When ocean conditions become increasingly variable, it could jeopardize the species. For example, in 2008 and 2009, chinook fisheries in California and southern Oregon were shuttered after very few fish returned to spawn, which researchers attribute to poor ocean conditions that occurred in 2005 and 2006. 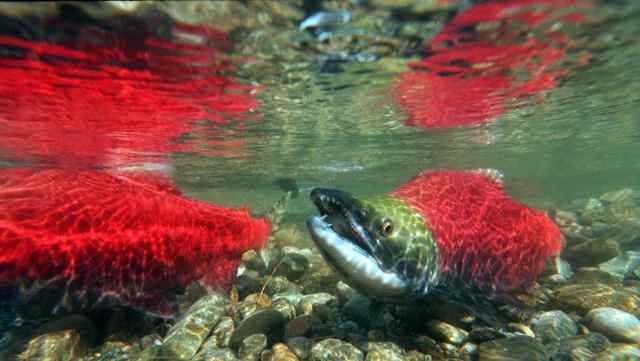 The status of salmon populations in California and the Pacific Northwest varies, but, in general, the species is extremely sensitive to both natural and human stressors, on land and in the ocean. Both have taken a toll on wild salmon populations, especially in the Pacific Northwest, according to the National Oceanic and Atmospheric Administration. Nate Mantua, a researcher with NOAA's Southwest Fisheries Science Center in Santa Cruz, Calif., said a lot of research indicates the early time period young salmon spend in the ocean is crucial for stock survival. "What happens with these large-scale climate patterns is that they are tracking changes in the oceans that are happening over huge spatial scales," said Mantua, who was not involved with the study but has written a soon-to-be-published commentary piece for Proceedings of the National Academy of Sciences. "The whole eastern part of the north Pacific, where salmon spend the ocean part of their lives, is being affected." The study, published this week in PNAS, finds that, since the 1980s, the forces driving El Ninos have changed. That shift is what Kilduff and his colleagues assert is affecting the rates in which these two fish species survive in the ocean. In the last three decades, El Nino events have been more frequently associated with central tropical Pacific warming rather than Pacific warming from the east. There is some debate in the scientific community as to if this change is driven by climate change or natural variability, Kilduff said. The latter is associated with the oft- mentioned Pacific Decadal Oscillation (PDO), whereas central tropical Pacific warming is linked to the North Pacific Gyre Oscillation (NPGO). The authors note the mechanics of how NPGO affects ocean productivity and by extension salmon is not as well understood. Whereas the PDO will cause the coast from southeast Alaska all the way to Baja California to warm and cool together, the NPGO is more uneven, Mantua said, and tends to bring warmer water off the coast of Vancouver Island to southern Oregon. Salmon prefer subarctic waters, not subtropical. "These big picture climate patterns, the PDO and NPGO, are telling us something about the state of the Pacific Ocean and the West Coast," he said. "It's not just salmon that will be affected, but sea birds, krill and other temperature-sensitive species." While Kilduff said the research doesn't unpack the reasons why these large ocean-current patterns are shifting, the merging of survival rates for these two species points to reduced biodiversity. "The key thing is to keep looking at these things. If it looks like a NPGO is coming up and if the NPGO is looking like its poor for salmon, it's something they're going to have to be planning for," Kilduff added. "What kinds of harvest restrictions or rules need to be put in place along the coast? It comes down to making management decisions." At every stage of their lives, Pacific salmon are affected by changes to water hydrology, said Colin Shanley, a researcher with the Nature Conservancy. Shanley and his colleagues published a study last year in the journal PLOS ONE that documented how Pacific salmon in southeast Alaska are being affected by climate change. 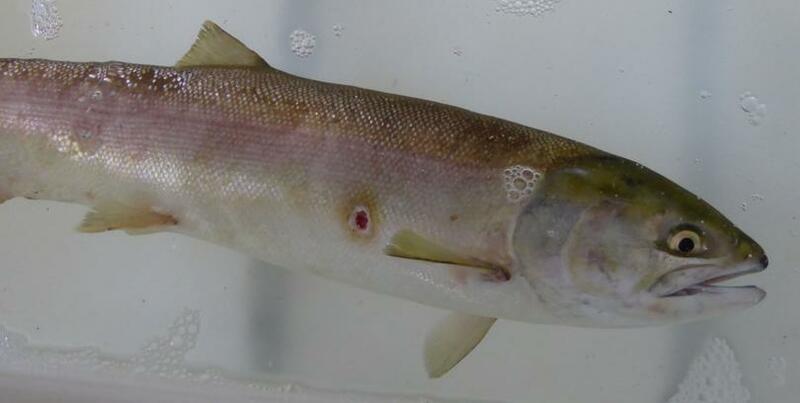 Although they mostly focused on the ways freshwater habitats are being affected, they did note that warmer winter water temperatures are driving accelerated rates of fish development. Furthermore, they found the salmon harvest increased during the warm phase of the PDO in Alaska. In southeast Alaska, in particular, Shanley said the impacts of a changing climate -- both when there was an increase in rainfall and a decrease -- are vulnerable situations for salmon populations. 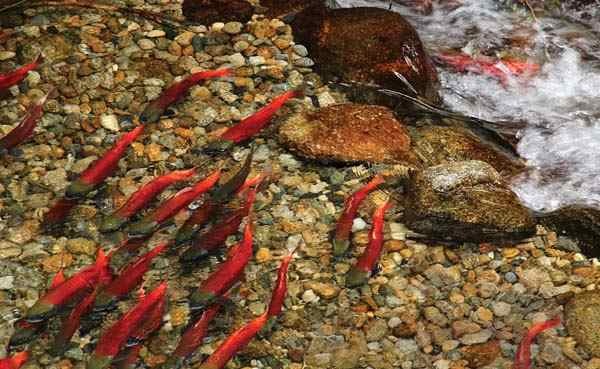 Too much rain, or rain that melts a snowpack suddenly, can fill a stream quickly and destroy salmon eggs. Less rain and warmer temperatures reduce the amount of water in streams, which also can harm fish, he said. But not all fish populations are doomed either in fresh water or in the ocean, he added. Overall survival of the species is reliant on habitat diversity. A changing climate will most likely not affect every habitat all in a negative way. For example, some of the glacial systems in Alaska might become more productive as the climate changes, he said. "In Alaska, that's definitely the case," he said. "In other places, though, the genetics aren't as strong, there aren't the hatchery fish, and habitat diversity isn't as high." Across the West, fisheries managers are struggling to save fish struggling with abnormally warm summer waters. This week, the Oregon Department of Fish and Wildlife said it is considering doing away with limits on fishing for catfish, bass and other fish that thrive in warm waters and are threatening native salmon and steelhead. 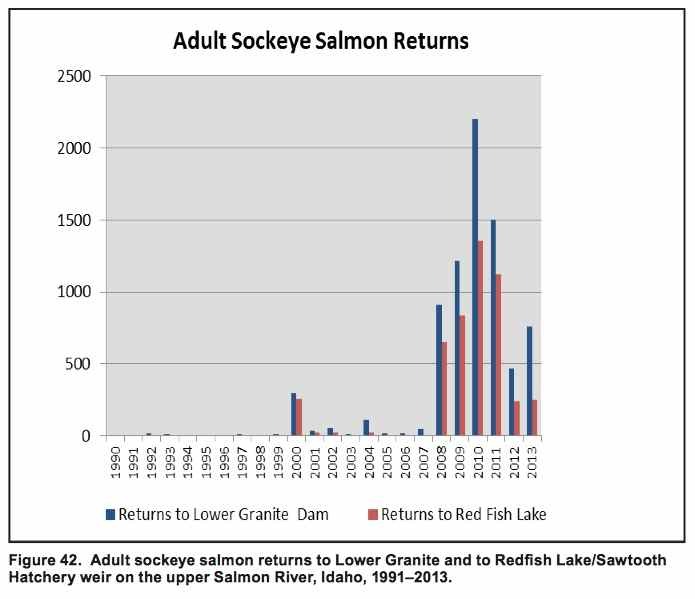 State officials said nearly half of sockeye salmon migrating up the Columbia River through Oregon and Washington state have been killed because of the hot water. Washington has taken similar actions on the Columbia River and are also seeing thousands of fish dying off. Tough freshwater conditions can stress juvenile fish as they try to migrate to the ocean, explained Tony Farrell, a biologist at the University of British Columbia, in a video about how this year's low snowpack and record high temperatures are affecting sockeye salmon that are migrating from the Pacific Ocean to the Fraser River, the longest river in British Columbia, to spawn. "Summer temperature in the Fraser River is so important, so it's closely monitored," he said. Just a few extra degrees of warming can decrease a fish's ability to take up oxygen into its muscles and swim. Fungus and bacteria also thrive at warmer temperatures. And even if the fish make it to the ocean, they face increased predation because of warmer waters. "It's been particularly warm out in the Pacific Ocean this year, which means there's a lot of hungry mackerel and tuna waiting to eat baby salmon as they migrate from the Fraser River to the Pacific in search of food," Farrell said. "The mackerel and the tunas like the water a little warmer than the salmonids, so when warmer water moves north, as it does periodically, they follow. But because the Fraser River can't move, it's a bit like running the gauntlet for the salmon smolts." Back in the Pacific Ocean, Kilduff said he hopes his research can be used by fisheries managers to make changes to freshwater practices, which are within human control, in order to account for a loss of survival rate variability out in the open seas. "It's another thing to keep an eye on," he said. "It's a nice thing to be able to say certain environmental conditions influence things in a given way, but it's also a very tough thing to do. There were some really clear PDO signals, and now we're seeing the NPGO starting to play an important role, and it's keeping everyone on their toes."